Since they’re not visible, it can make it hard to spot when leaks or other types of damage occur with them. The good news is, the technicians on our team can address this problem of leaking ducts quickly and efficiently. But you have to know something is wrong to begin with to know to call for repairs, right? We’ll get to that below, but first we want to explain how duct leaks happen and why they are a problem. Ductwork can develop leaks from a few different things. Doing construction work in one part of the house could inadvertently damage the ductwork in another if the workers aren’t paying close enough attention. Or, animals like squirrels or other rodents can get into your attic and scratch up your ductwork. Usually, however, ductwork develops leaks due to natural wear and tear. For example, if a bolt holding two pieces of ductwork wears out, a leak will typically form by default. Why Is Leaking Ductwork a Problem? The air leak warms the temperature of the cool, conditioned air. The air leak reduces overall airflow throughout your ductwork. Either of these issues will rob your air conditioner of energy by forcing it to work harder than it should have to in order to do its job. This raises both your monthly bills and your chance of a more serious breakdown if the issue isn’t resolved. Hot Spots in Your Home: (or cold spots, if it’s during the winter and you’re using your heating system). Strange Noises: This can include whistling, banging, or hissing. A Decline in Airflow: You’ll notice that one or more of your vents have air coming through it less powerfully than the others. Higher Energy Bills: This is caused by the loss of efficiency generated by the ductwork leak. Warmer Air Coming From Vents: This can be a sign of a problem with the air conditioner itself. However, if you’re only noticing it from one vent or a couple vents while other rooms are receiving the cool air they should be, then your ductwork could very well be to blame. If you notice any of the above-mentioned problems, give our pros a call! 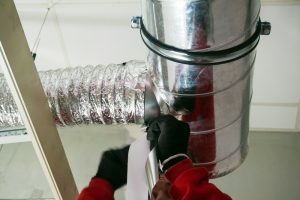 It may be that you need professional duct sealing, or possibly even duct repair. For quality Valparaiso, FL HVAC services, contact Kool Breeze of Northwest Florida, Inc. today!